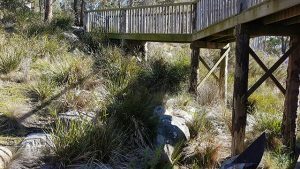 Bed in the Treetops is a truly unique, quality appointed Bed & Breakfast hideaway nestled high on an 37 acre property at the Bay of Fires, situated on Tasmania’s beautiful North East Coast. The home has been designed and constructed to take full advantage of the location and enhanced with the use of Tasmanian timbers. 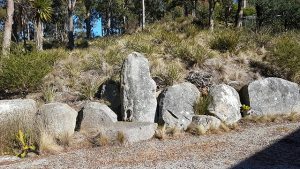 It is perched 160 metres above sea level, and enjoys birds eye views of Binalong Bay, Moulting Bay,Georges Bay, St Helens Island and the Southern Ocean. We offer a choice of two private, quality, open plan spa suites, and can accommodate up to 6 guests. Please note : Accommodation not suitable for children under 12 years old. Both suites adjoin the hosts’ residence at ground floor level, and each has its’ own private entry and sun deck. Local birdlife is part of a Bed in the Treetops experience, such as sea eagles, yellow-tailed black cockatoos, parrots, pelicans, wrens and rosellas. You may catch a glimpse of a wallaby, possum, echidna or wombat on their night-time wanderings. Each morning in our upstairs Dining room, a wholesome breakfast awaits you, featuring fresh home-baked bread, free range eggs from our own chooks, served with freshly picked herbs from our vegetable garden. We also offer complimentary afternoon tea on arrival. Bed in the Treetops really is the ultimate Bed & Breakfast retreat, with its’ magnificent bush setting and stunning bay, ocean and mountain views. Copyright © 2019 Bed in the Treetops BnB. Powered by WordPress. Theme: Spacious by ThemeGrill.